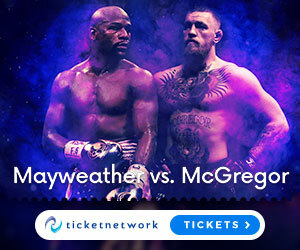 If you love MMA like me then you always keep an eye out for the upcoming List of UFC events – then after this you might also think how can I get tickets for this awesome event? Well in today’s post we are looking at the huge UFC 220: Miocic vs Ngannou fight card on Saturday January 20th, at the TD Garden, Boston, MA. I will analyse and give you all the ticket booking information you need to attend this historic event! Is this the first UFC card you want to go to? Well nothing compares to UFC live events and I’m being serious when I say you literally can’t get any bigger then this one! Because all MMA fans will be on the edge their seat as two colossal men collide in the UFC Heavyweight division when current champion Stipe Miocic will take on the hugely fearsome Francis “The Predator” Ngannou. Francis Ngannou is one of the major talking points in the world of MMA currently, because his displays of physical strength and KO power in the UFC have been shockingly impressive thus far in his 6-0 UFC career, finishing all of his opponets. Most recently he stopped Alistair Overeem via brutal first round KO, and it s a KO which is being discussed as the best KO punch ever in UFC history. However, current champion UFC Heavyweight champion Stipe Miocic is an absolute beast himself as his current 5 fight win streak has taken him to the title and already two defences under his belt. How does the whole card look? Stipe Miocic vs Francis Ngannou – can current champion Stipe Miocic defend his bet for a 3rd time and solve the nightmarish riddle that is Francis Ngannou? From a match up perspective Miocic probably has the best chance of anyone in the heavyweight division Ngannou has faced so far to stop his hype train dead in its tracks. Its Miocic’s wrestling that could be the difference maker here, as swell as his phenomenal cardio, punching power, boxing skills and general toughness – Stipe Miocic is a true Heavyweight champion who has exploded into his title reign. But one thing is for sure – its going to take a special kind of athlete to knock Miocic off the Heavyweight throne and Francis Ngannou is one hell of a special athlete. Regardless of not being a particular technical specialist anywhere, it is Ngannou’s physical strength and punching power that is really unrivalled in MMA right now in many respects.He is one of the most powerful punchers to ever step foot into any combat sport, a frightful proposition for any fighter to have to face. Bottom line as much as I love Stipe Miocic and think he is one of the greats, as much as I can see him battling through adversity to victory like he has so many times in the past – I just cant see anyone standing up to Ngannou right now, so I predict Ngannou will become the new UFC Heavyweight champion, probably via another highlight reel KO. Daniel Cormier vs. Volkan Oezdemir – In the co main event things dont get much smaller as we switch up to the Light Heavyweight division to bare witness to Daniel Cormier looking to defend his UFC Light Heavyweight title against the blazing train at 205 which is Volkan Oezdimir. Oezdemir is undefeated at 3-0 since entering the octagon, already making a name for himself as a fast KO artist who has impressed massively in all his bouts thus far. However for years most in the world have believed that Jon Jones was the best Light heavyweight in the world, and despite losing to him twice, the revelations of Jones’s repeated drug bans as caused most to view Daniel Cormier as 205’s natural champion in Jon Jones’s repeated absence.The main reason is Cormier’s insane wrestling skills, solid boxing, good cardio and general toughness which has caused him to be undefeated against anyone not called Jon Jones. For instance do I really think that Volkan Oezdemir would beat Anthony Jonhson twice? Im not sure I do – so for me I have to go with Daniel Cormier to retain his 205 title most likely by dominating Oezdemir with a smothering Wrestling style. But if Oezdemir does win you knnow it will be by early KO. Kamaru Usman vs. Emil Meek – Man I’ve been waiting for this fight for a while now, ever since it was originally booked for UFC 219, so you can read my breakdown of the fight there. Meek was having visa issues so the fight had to be rescheduled, but ultimately I just see Usman dominating Meek with his incredible wrestling, strength, athleticism and cardio at 170 pounds to get a unanimous decision win. Usman is potentially a future UFC title challenger at Welterweight, and given the rise of Francis Ngannou, who knows we could potentially see a UFC Africa event in the future with The Predator and the The Nigerian Nightmare both on the card as champions in the future. On top of these great fights we also have – Islam Makhachev vs. Gleison Tibau, Gian Villante vs. Francimar Barroso, Calvin Kattar vs. Shane Burgos, Kyle Bochniak vs. Brandon Davis, Dustin Ortiz vs. Alexandre Pantoja as well as more additional fights to be announced! So how can I see these fights live? Well what you need to know first off is the costs for attending a UFC event ranges hugely, don’t take it personally its just a matter of the costs the UFC owners have for each event. Holding events in world famous arenas has varying costs, also it depends how close to the cage you want to be which affects prices massively and also the bigger the star name fighters on the card, this also causes ticket prices to go up for obvious reasons. So for this UFC 220: Miocic vs Ngannou fight card happening on January 20th at the TD Garden, Boston, MA the ticket prices are currently ranging from $96 – 1,827.00 (USD). If you want to look at the ticket prices and seating plans right now then get onto my favourite ticket booking site. Prepare for the clash of the TITANS! That’s what this UFC 220:Miocic vs Ngannou card at the famous TD Garden in good old Boston is all about really, its the clash of the biggest men in the UFC organisation, the true titans of the octagon and I have a feeling this will be a truly memorable start to 2018! We all need to start the new year with a bang, and this is one of the best ways to start, so if you agree with me and you really want to see this card live and in the flesh, then you need to click right HERE. Don’t miss out on seeing who is the baddest man on the planet on January 20th, and of course don’t forget to keep your eye on the List of UFC events and the future schedule. True I can’t freaking wait! In the beginning I was like who is that wild mother effer here walking all big and stuff. I thought Overeem is going to school this boy. And then I saw that uppercut that defiend all laws of physics. Overeem’s head should have flown to the mars before Elon. Can’t freaking wait to see how Stipe handles him! Hey Alex, oh yeah this is it bro! Ngannou has got everyone scared after that Overeem KO, like you said it kind of defied the laws of physics how hard he hit him really – the guy has got the most powerful punches I have ever seen in MMA. It will be fascinating to see if Stipe can give Ngannou a lesson, but I wouldn’t bet on that! Also if you want to keep an eye on upcoming events then check out the schedule page. I am a UFC lover and I enjoy watching a competition. I am sure your list of matches and schedules will help fans of this sports. In your list, the fight matches are until March. Your target audience will have a good preparation in their own choices on which is available during their availability also to watch. I noticed Mayweather vs McGregor is still in the advertisement are they having a rematch in boxing or they will compete in UFC?